Startups get Grover is the official offering from Grover specifically targeting startups. This meant the website had to feel like something starting up, communicate use cases for small businesses that made it clear that Grover is a great option for small businesses who have limited capital, but big ideas. 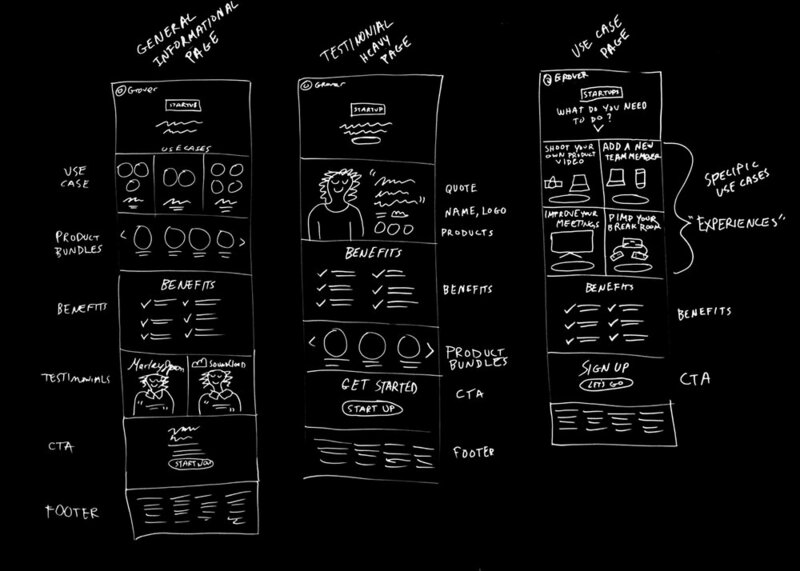 Before getting started, I whiteboarded potential layout ideas. This helped to understand what we wanted to communicate at all on the site, and give relevant stakeholders a quick idea of what could appear on the site without yet getting stuck talking about visual design. Here is an example of one of the use case pages. The idea here was to give startups ideas on how they could rent their tech with Grover. This particular use case covers how startups could rent the tech they typically would have to buy for a special party or event. Is there a line at…?